The world of fashion has always been dominated by beautiful people – but rarely have those people been beautiful and out of their twenties. However, if the latest set of catwalk shows are anything to go by, the world of couture is witnessing a huge sea-change when it comes to using older models. Recent Fashion Weeks in London, New York and Milan have seen a slew of more mature beauties wearing high-end designers and celebrated for their age and experience. Supermodel Christy Turlington, who, at 50, might have once been expected to hang up her heels for good, has been striding forth for Marc Jacobs, showcasing his latest Fall collection in the Big Apple. And Michael Kors, also in New York, tipped his hat to Patti Hansen to end his latest show. While much younger models du jour, including sisters Bella and Gigi Hadid, took to the catwalk too, it was Hansen, at 62, who stole the show. 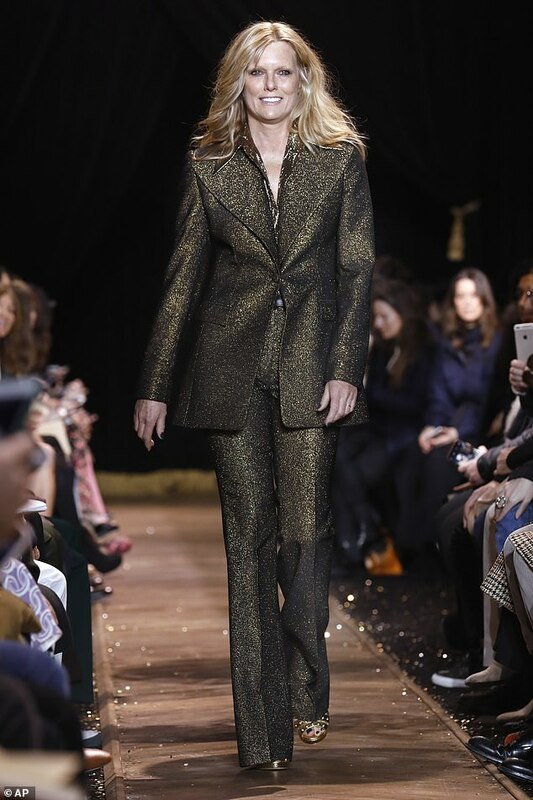 Hansen, a ’70s superstar model, is married to Keith Richards and took her turn in the spotlight with a smile on her face, dressed in an iridescent trouser suit of black and gold. Hansen revealed after the show that her beauty isn’t down to a lifetime of wonder products, she admitted that she barely moisturised until she was 60 but now swears by Retin-A, a prescription medication often used to treat mild to moderate skin conditions. Shalom Harlow, 45, has seen her career go from strength to strength, modelling Versace’s new Spring/Summer 2019 campaign with Bella Hadid, 22, and Irinia Shayk, 33. A video from the shoot, which has been viewed hundreds of thousands of times on Instagram, sees the 45-year-old brunette lifting up her feet and bending her knees from side to side to make her fluttering floral bell bottoms move just so for the camera. Jeny Howorth, whose became famous in the eighties for her elfin peroxide blonde crop, strutted her stuff last week for Simone Rocher in Milan. The model, now a grandmother, received a rapturous response to her appearance on the catwalk, as age appears to be finally something for the vacuous world of fashion to celebrate. Jeny Howorth, whose peroxide blonde crop made her famous in the 80s, continues to swish down the catwalk. The grandmother most recently modelled for the Simone Rocha show in Milan. Nineties model Tatjana Patitz was once one of the fashion world’s most famous faces, appearing alongside the likes of Cindy Crawford in George Michael’s Freedom video. Patitz, who dated soul singer Seal before Heidi Klum, stepped out in Milan too. Last week, the 52-year-old owned the catwalk as she showed her famous poise walking the runway at the Etro show. And when Stephanie Seymour, 50, was asked to get back on the runway after 20 years, she didn’t hesitate.